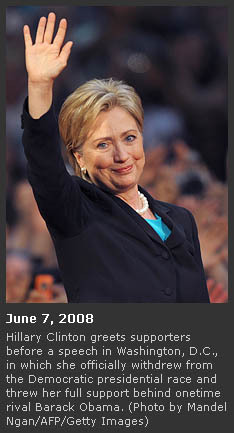 June 7, 2008 Hillary Clinton ends her historic quest to become the first female president. In a speech in Washington, she tells her supporters to unite behind former rival Barack Obama. 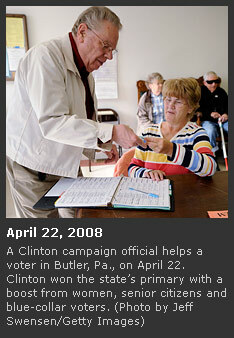 June 3, 2008 The Democratic primary season ends with contests in Montana and South Dakota. Clinton wins the South Dakota primary, but Obama secures enough delegates to claim the nomination. 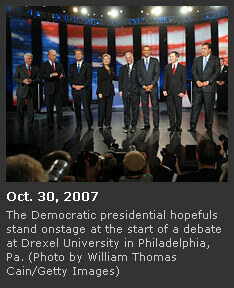 May 11, 2008 Obama takes the lead in the superdelegate count, which Clinton once led by nearly 100. 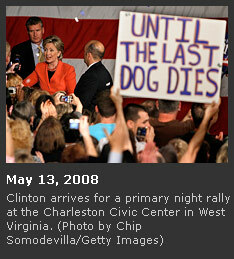 May 8, 2008 In an interview with USA Today, Clinton says that “Sen. Obama’s support among working, hard-working Americans, white Americans is weakening.” She later tells CNN it was a dumb thing to say. 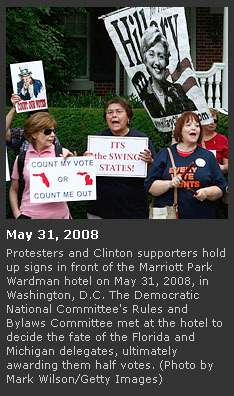 May 5, 2008 The Clinton campaign begins arguing that the number of delegates needed to secure the Democratic nomination is 2,209 (not 2,025) – a majority of convention delegates, including full voting representation from Michigan and Florida. 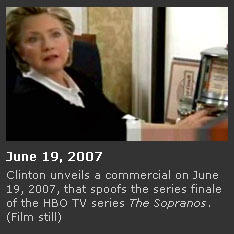 May 1, 2008 Clinton loans her campaign $1 million. 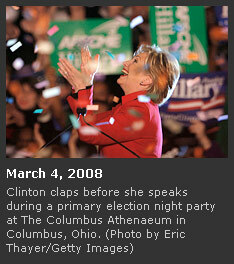 April 11, 2008 Clinton loans her campaign $5 million. 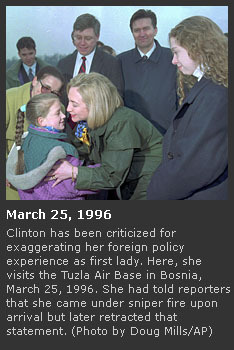 March 24, 2008 CBS News releases archival video of the 1996 welcoming ceremony for then-First Lady Clinton in Tuzla, Boznia. On the campaign trail, Clinton had recalled landing “under sniper fire” and running “with our heads down” to the transport vehicles. But the CBS video shows Clinton receiving flowers from a child on the tarmac. March 20, 2008 The Michigan state Senate announces it will not approve a re-vote. March 18, 2008 The Florida Democratic Party says there’s no chance of a re-vote there. March 5, 2008 Clinton’s campaign reveals that the senator loaned her campaign $5 million in February. 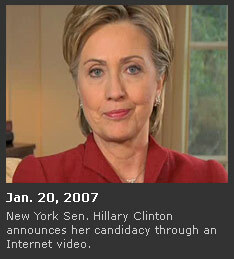 Feb. 29, 2008 The Clinton campaign releases an ad called “Children,” also known as the “3 a.m. phone call” ad. Feb. 9, 2008 Obama wins contests in Louisiana, Nebraska, Washington state, and the Virgin Islands and opens up a lead in the pledged delegate race. Clinton begins an 11-contest losing streak that will last through the month of February. Jan. 29, 2008 Hillary Clinton wins the Florida primary by 17 points. Like Michigan, the state defied party rules and scheduled its primary before Feb. 5 – and like Michigan, no candidates campaigned there. Unlike Michigan, all the candidates are on the ballot. Clinton holds a rally outside Ft. Lauderdale shortly after the polls close. Jan. 26, 2008 Bill Clinton minimizes Obama’s South Carolina victory, pointing out that “Jesse Jackson won South Carolina in ’84 and ’88.” The comment strikes another blow to the Clintons’ popularity in the black community. 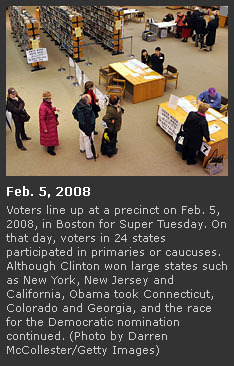 Jan. 15, 2008 Clinton wins the Michigan primary, a state stripped of its delegates as punishment for moving its primary up to January. No one campaigns there, and Obama’s name is not on the ballot. Jan. 13, 2008 BET founder Bob Johnson introduces Clinton in Columbia, S.C. He says the Clintons were “involved in black issues when Barack Obama was doing something in the neighborhood that -- I won’t say what he was doing, but he said it in his book.” The statement is perceived as another shot at Obama’s high school experimentation with drugs. Johnson makes various excuses before eventually apologizing to Obama. 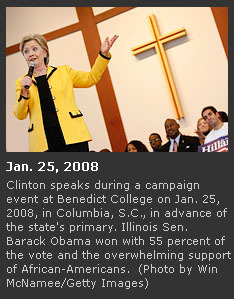 Jan. 7, 2008 Clinton tells Fox News that the Rev. Martin Luther King Jr.'s dream couldn’t have been realized without Lyndon Johnson passing the Civil Rights Act, saying, “It took a president to get it done.” Collective eyebrows are raised, especially in the black community. Jan. 5, 2008 At the New Hampshire ABC/WMUR debate, moderator Scott Spradling asks Clinton why voters seem to like Obama more. She responds, “Well, that hurts my feelings.” Obama chimes in, “You’re likeable enough, Hillary,” a response widely criticized as condescending. 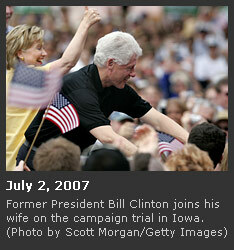 Jan. 3, 2008 Clinton places a surprising third in the Iowa caucuses, behind Obama and former North Carolina Sen. John Edwards. 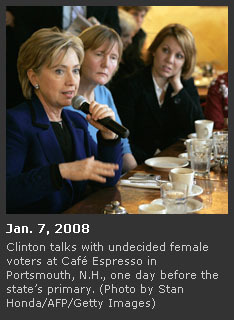 Dec. 29, 2007 The Concord Monitor endorses Clinton ahead of the Jan. 8 New Hampshire primary. Dec. 12, 2007 Clinton New Hampshire Campaign Co-Chair Billy Shaheen tells a reporter that if Obama is the Democratic nominee, Republicans will exploit his self-admitted youthful experimentation with drugs and alcohol. Shaheen resigns from the campaign the next day, and Clinton personally apologizes to Obama, saying that negative personal attacks are not part of her campaign. Dec. 2, 2007 The Clinton campaign issues a “fact-check” of Obama’s stump speech line that he’s not running for president because of long-held ambitions. It cites an essay he wrote in kindergarten titled, “I Want to Become President.” Following snickers from the news media, the Clinton campaign subsequently claims it was kidding. 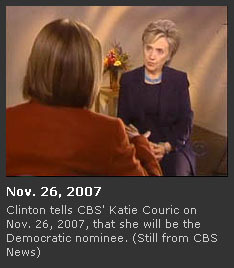 Nov. 26, 2007 Clinton tells CBS’ Katie Couric that she will be the Democratic nominee, and that the nomination will be sewn up by midnight on Feb. 5, 2008 (Super Tuesday). June 19, 2007 Clinton announces the winner of the online voting for her campaign’s theme song: “You and I” by Celine Dion. The announcement video is a spoof of the series finale of HBO's The Sopranos. March 31, 2007 End of the first quarter of 2007. Clinton’s campaign raises $36.1 million in the first three months of the year -- nine months before any primaries or caucuses. March 5, 2007 “Vote Different,” a mash-up of Apple’s famous “1984” ad – this time featuring Clinton as Big Brother – appears on YouTube and quickly goes viral. The Huffington Post later outs Philip de Vellis, an Ohio Democratic strategist, as the video’s creator.